These soft and succulent cookies have a consistency half way between cake and cookies. 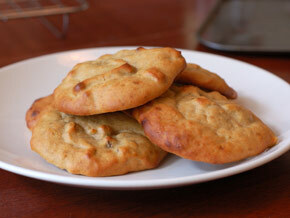 The banana gives each cookie a moist and fruity flavor. Soy/soya flour (available from health food shops) allows for a lot of healthy goodness to be hidden in each cookie. 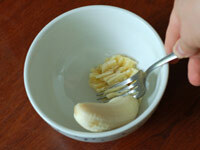 Mash all 4 bananas in a small bowl using a fork, then transfer to a larger cooking bowl. If you want to have less washing up you can mash the bananas in the large bowl but you will find it a lot harder work. 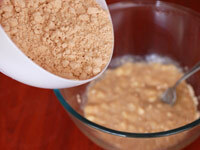 Slowly mix the soy and wholemeal flour into the bananas causing the mixture to thicken. 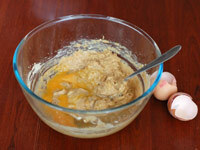 Mix in the eggs and olive oil to form form a smooth paste. 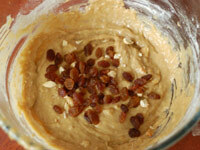 Add the cashew nuts and raisins and gently mix them in. Line two baking trays with baking parchment and lightly grease the surface with a little butter. 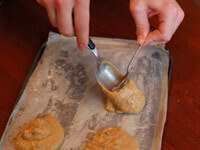 Using two spoons transfer six large scoops of the mixture onto each baking tray. Cook for 15 minutes in an oven preheated to 190°C/380°F/Gas Mark 5.